I wandered into your servers a while ago to ask for forgiveness for frag-rounding the crap out of some people in Metro accidently. You guys and gals were nice so I came back and now here we are. 1. I like shooting people in video games, bonus points if their name starts with 'Jacknife'. 2. I'm a very good cook. 3. I've jumped out of perfectly good airplanes. 4. I know the truth about Avocados - they're compressed, green pond scum. 5. I once got Jack's tags. They were delicious. 7. I prevented a murder. 9. I work for an intelligence agency. 10. I have the following pets: a lizard, named Fred, one small dog: Sasha, and at least once during the summer, lots of ants. 11. I want to be MrsVirtue when I grow up. Made me laugh, welcome to the forums! @[member='Shilea'] damn, finally you made your post geez. Welcome to the forums and remember to jump in T..... Well you skipped that xd. Hahaha. That's good stuff. Glad to see you finally decided to join! Bonzai your partner in crime. @[member=Shilea] You confuse me. So, basically 1-11 aren't true (since the * is before the entire list?!?! ) Anyways, thanks for finally making a forum account and applying! see you in-game! naww jk she won't want anything more than yo take your tags and tbag you until tears of joy stream down her face. Wow, its like you're in my mind! 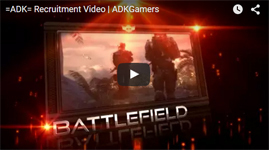 Welcome to the =ADK= forums! Glad to see you finally decided to join us. @[member='Shilea'] my tbag buddy, I guess you must like it but thats good cause I got a hole box full of them :P - Oh well I guess I have to be nice to you now, atlest most the time. See, this is what happens when a person actually takes their time and gets to know people before they put in an app. Is that good or bad col? Thanks everyone for making me feel so welcome! Nice to meet you Phire, I've never tried Planetside before, I'll have to give it a shot. What did I just witness here. . .
welcome its good too see you. And do you name each ant? @[member='VMak'] - you leave my darn tags alone! Get your own unicorn! @[member='Vhalroth'] - I name them in order like this: SoonToBeDeadAnt1, SoonToBeDeadAnt2, etc. Then I have a little funeral for them later.